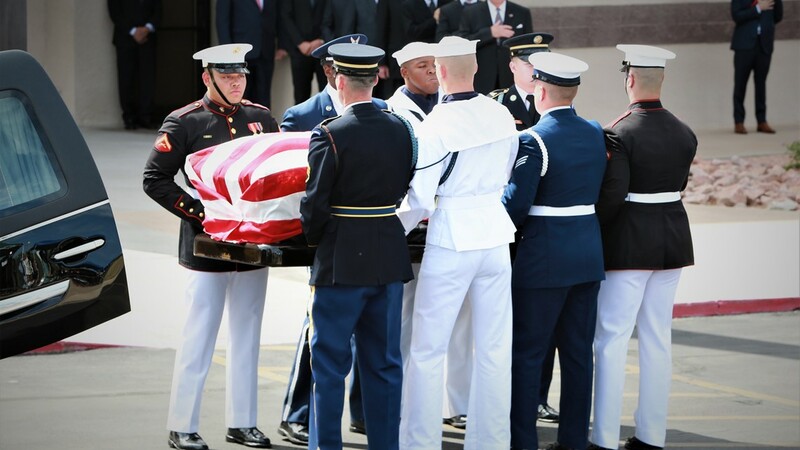 John McCain left Arizona for the last time Thursday, after a memorial featuring eulogies from Larry Fitzgerald and Vice President Joe Biden. 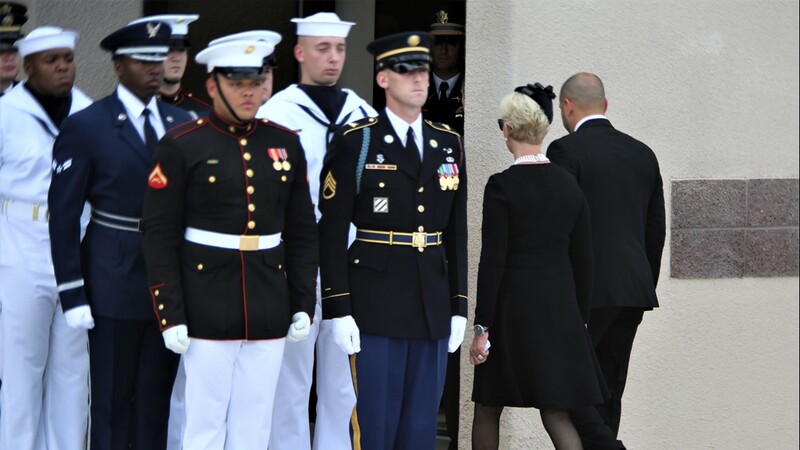 McCain is one step closer to his final resting place. 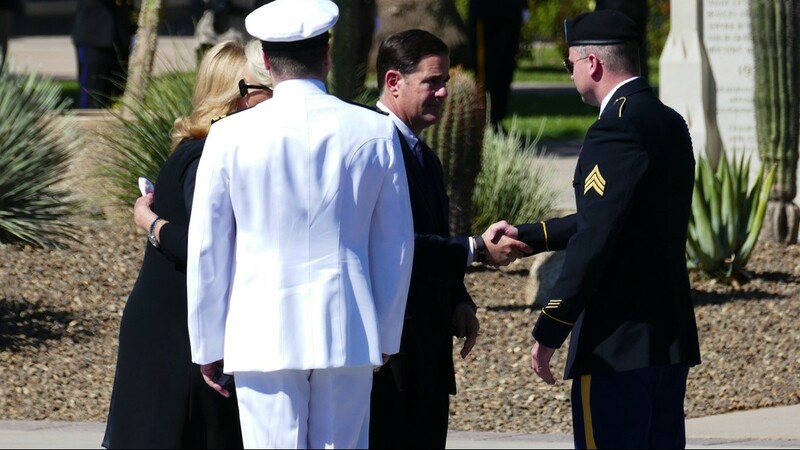 PHOENIX - Sen. John McCain has left behind a lasting legacy of service to this country and to the state of Arizona. 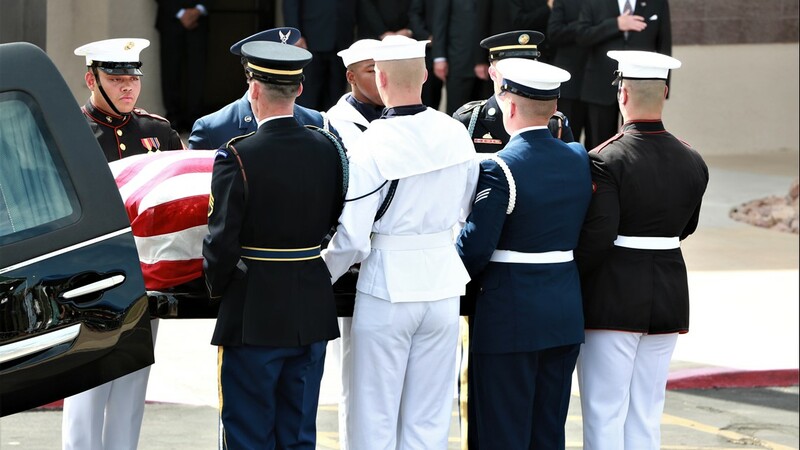 Thursday marked the second stop on his journey to his final resting place in Annapolis. 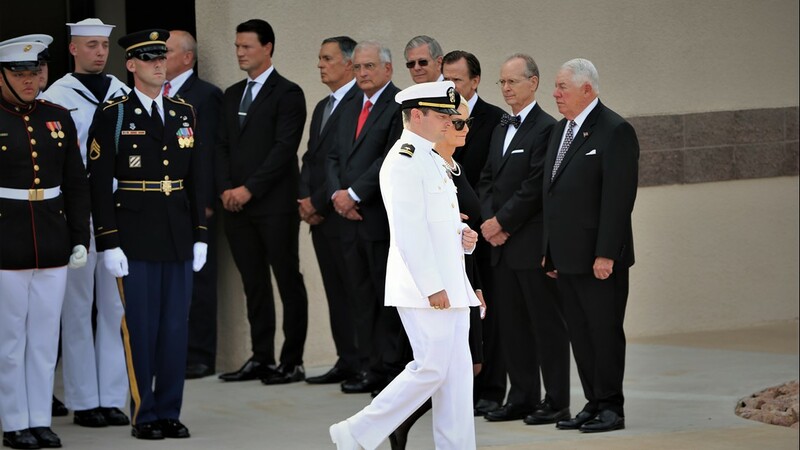 Political giants, local athletes, and thousands of the people who elected him to serve Arizona for over three decades were in attendance at North Phoenix Baptist Church to honor the senator. Frank Sinatra's "My Way" played on the church's speakers as the memorial service came to an end, the perfect representation of how many, who have spoken in the past week, said John McCain lived his life. 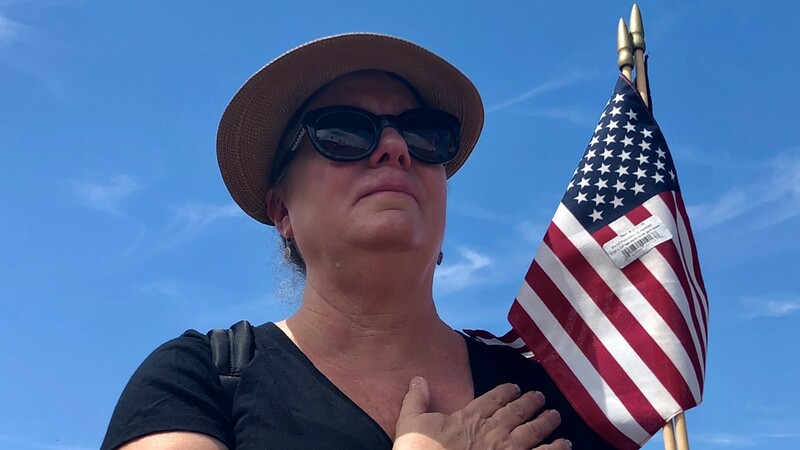 As McCain's motorcade carried his American flag-draped casket to and from the church, people and first responders lined the route to pay their respects to the man who gave so much for his country and state. Arizona's official historian Marshall Trimble said John McCain belongs on the "Mount Rushmore of Arizona." 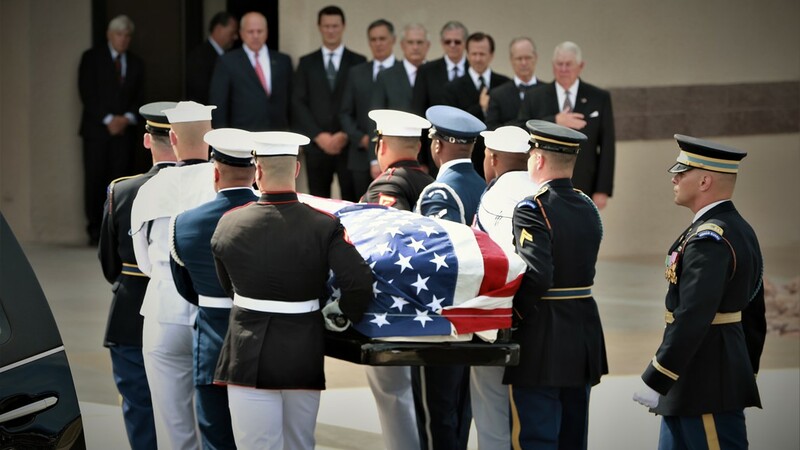 John McCain left Arizona for the last time Thursday, one step closer to his final resting place.McCain's remains will be moved to lie in state in the U.S. Capitol Rotunda on Friday, an honor that will include another ceremony honoring him and public viewing expected to last through the evening.Another memorial service awaits Sen. John McCain in Washington D.C., before he is finally laid to rest in a private ceremony Sunday, next to one of his best friendsThe two men who beat him in his presidential runs, presidents George W. Bush and Barack Obama, will speak at his memorial service Saturday.READ: Schedule of memorials and ceremonies honoring John McCain in Washington, D.C.
For the final time, Sen. John McCain leaves Arizona en route to the nation's capitol, on a plane fitted for the Vice President of the United States. 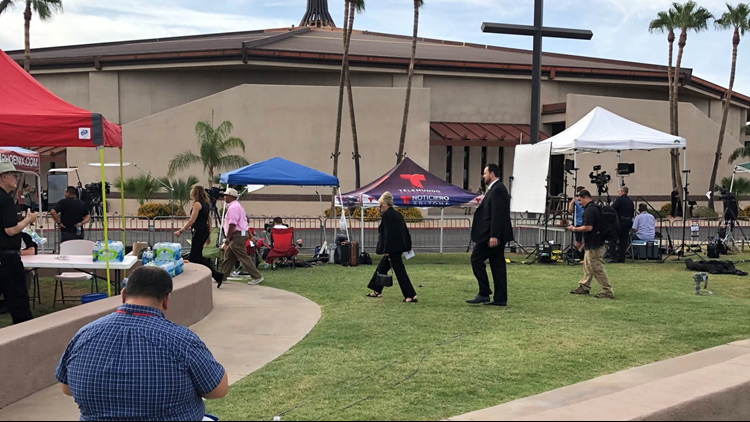 A crowd of supporters gather outside the church to say one last goodbye to Senator McCain. 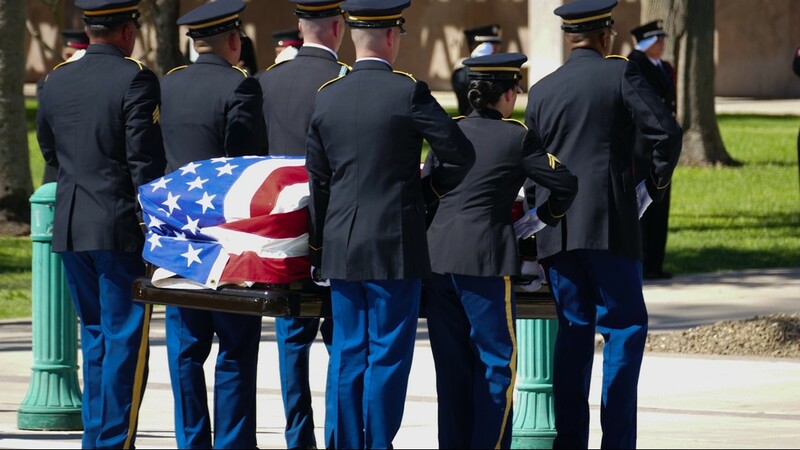 The American flag-draped casket of John McCain is carried out of the church, followed by his family. 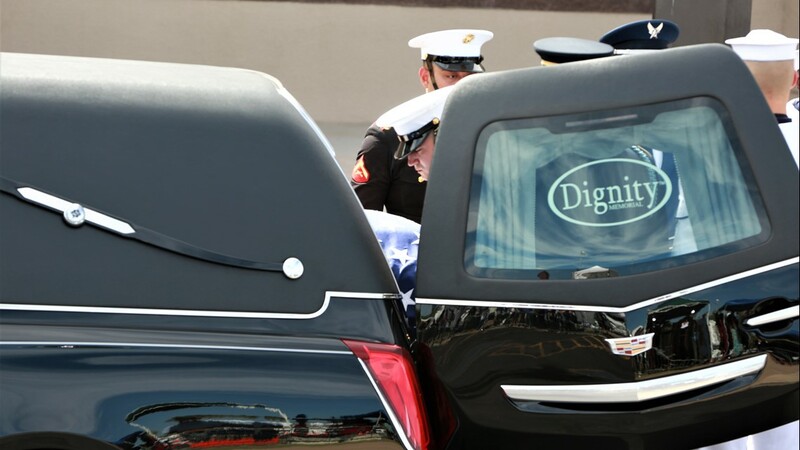 Frank Sinatra's "My Way," can be heard as they exit and the service ends. 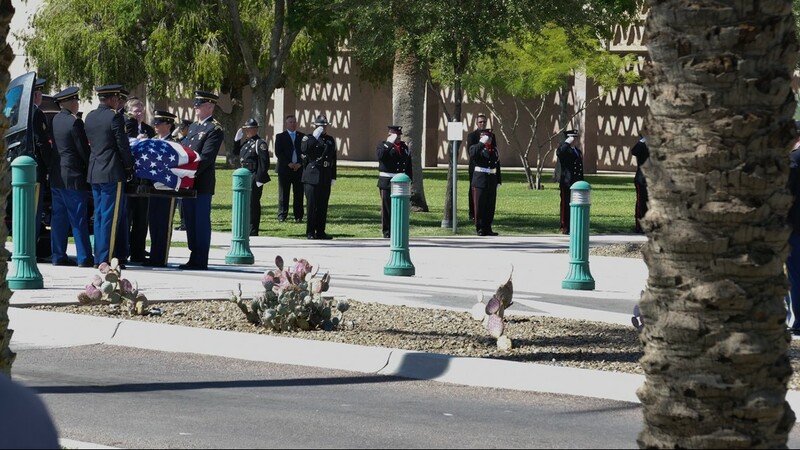 McCain’s motorcade will depart the church for Phoenix Sky Harbor International Airport where the senator will leave Arizona for the final time. "My name's Joe Biden. I'm a Democrat. And I love John McCain." Biden spoke the longest and began his remarks much like the others before him had: with laughter from the crowd. The former Vice President said he's always looked at McCain as a brother and he trusted McCain with his life. "We had a helluva lot of family fights," he said. The same disease that took McCain's life took the life of Sen. Ted Kennedy and "my beautiful son Beau," Biden said. "In order to survive we have to remember how they lived, not how they died," Biden said. Biden said the whole world shares in the aching of the McCain family, pointing around the church at the thousands in attendance as evidence. "John's story is the American story," Biden said. At times Biden raised his voice, speaking passionately about his friend John McCain. "Whenever I was in trouble, John was the first guy there," Biden said. " And we never hesitated to give each other advice." Speaking on why McCain's death has impacted the country so much, Biden said he thinks its because "they knew John believed so deeply and passionately about the soul of America." "I just think he gave Americans confidence," Biden said. Biden said what made John McCain special was his optimism. It made him "a giant" among us, he said. "John McCain's impact on America is not over," Biden said. Speaking to McCain's family, Biden said McCain owes much to what he was to his wife, Cindy McCain, and his kids are "proof of his success." Biden ended his remarks by paraphrasing Shakespeare: "We shall not see his like again." McCain's son, Andy McCain, followed Biden with another reading from the Bible. And the Brophy Student Ensemble performed "I love you, Arizona." Larry Fitzgerald told the story of his visit to Vietnam, where McCain was held as a prisoner of war many years before. The crowd laughed as Fitzgerald went through comparisons between him and McCain. He called it an "unlikely friendship." "He was the epitome of toughness, and I do everything I can to avoid contact." Fitzgerald said. Fitzgerald said McCain would text him to "pick it up" on Sunday. The crowd laughed again. "Yes, ours was an unlikely friendship, but it was one I will always cherish," Fitzgerald said. 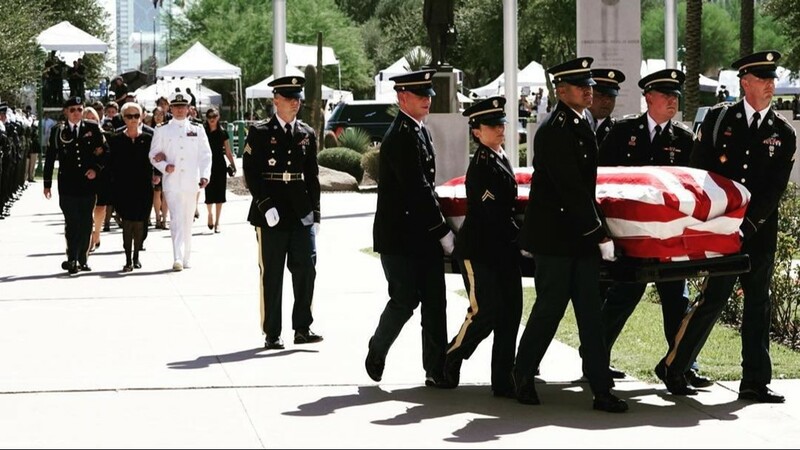 Fitzgerald said McCain "loved the people of Arizona." "He celebrated differences. He embraced humanity, championed what was true and just and saw people for who they were." "We are all better for having known you," Fitzgerald said. 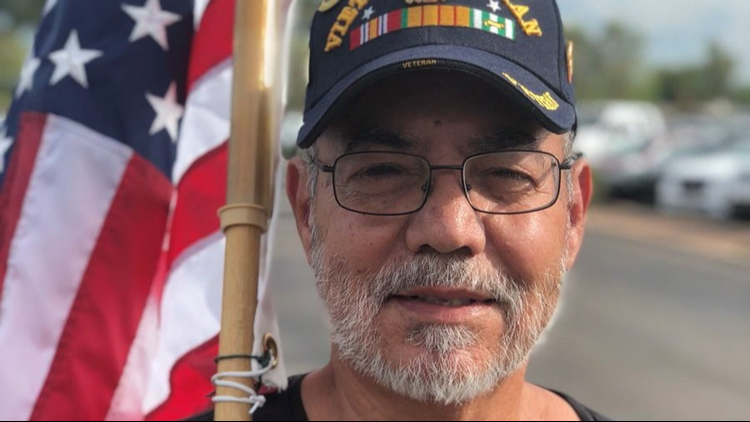 McCain's friend Tommy Espinoza said John McCain was a person who loved with his energy, who loved everyone, who loved his country. 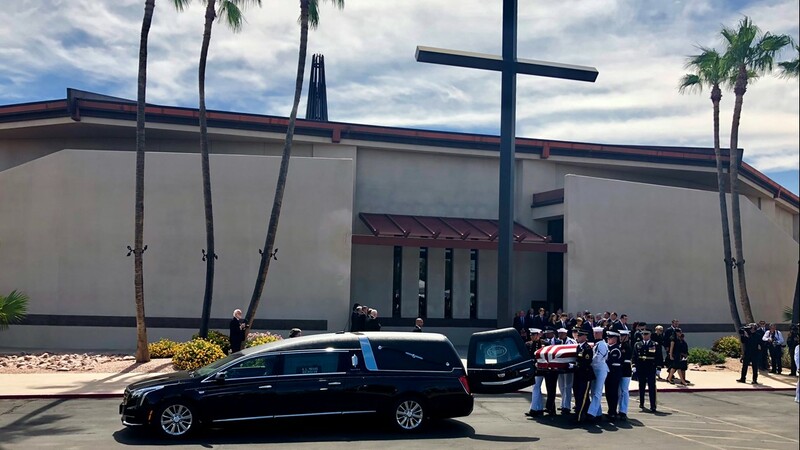 Laughter again filled the church as Espinoza told stories of knowing McCain and his interactions with the senator over the years. "To me John really did reflect our country in its true form," he said. Espinoza said John reflected love and "the love of a strong man, and that is nowadays hard to come by." "What he knew is that we all make America great," he said. 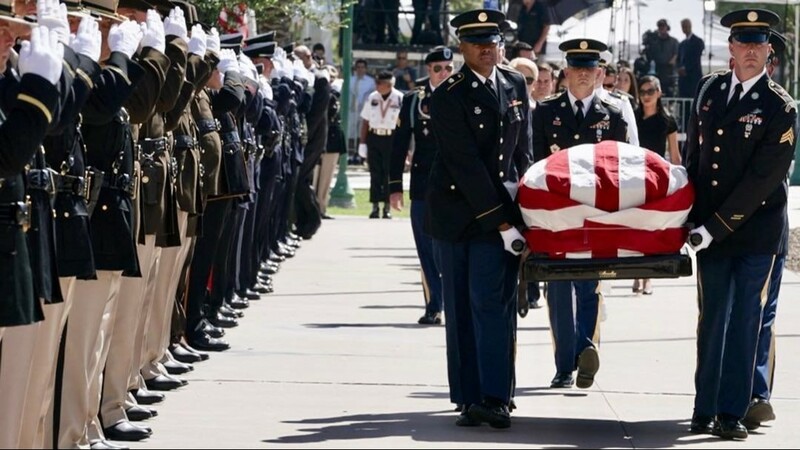 Espinoza said McCain's legacy will go on for generations because "people will talk about Sen. John McCain as one of the greatest heroes in our lifetime." Espinoza's touching remarks were followed by a performance by Jonah Littlesunday. McCain's daughter Bridget started the line of speakers with an emotional reading from the Bible. The senators' lifelong friend and former Arizona Attorney General Grant Woods had the crowd laughing with a story of the first few hours he spent with McCain and McCain's "ridiculously bad driving." Woods said knowing and working with McCain was "the greatest honor of his life." Woods said McCain loved Arizona and "Arizona loved McCain." “We’re going to miss so many things about him here," Woods said. 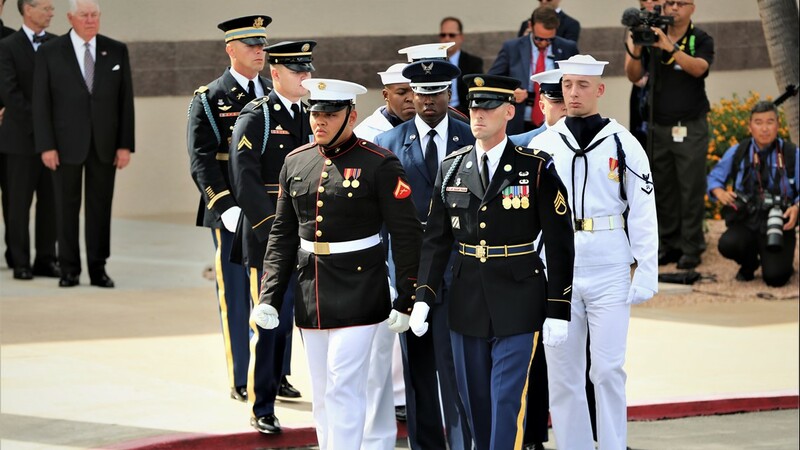 McCain, Woods said, was our hero in Arizona and "America's hero." "Sen. John McCain from Arizona. 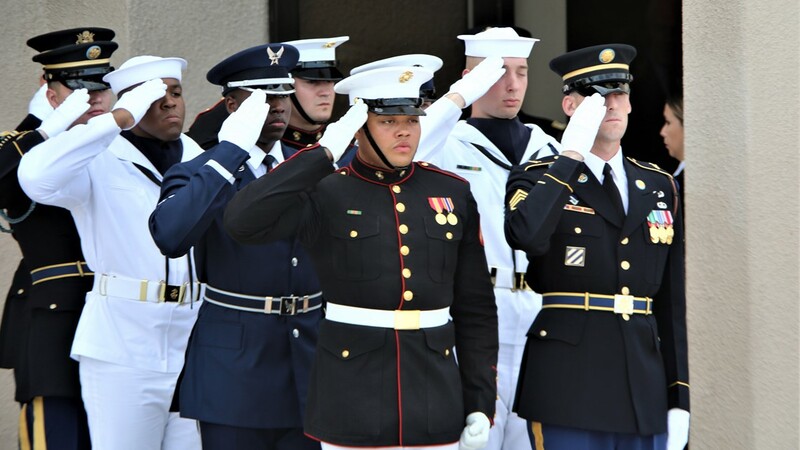 He served his country with honor, fought the good fight, finished the race, he kept the faith. Now my friend we can finish the song. Sleep in heavenly peace. Sleep in heavenly peace." The Brophy Student Ensemble performed "Amazing Grace" following an opening prayer by the church's senior pastor. 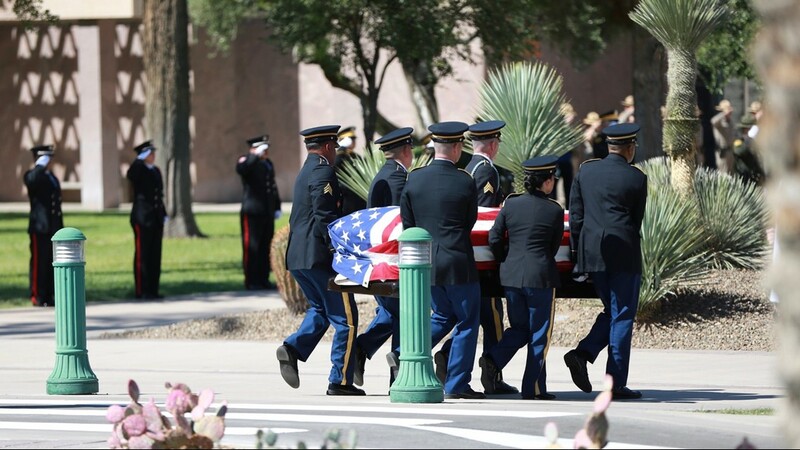 McCain's casket was placed near the stage.The memorial service for Sen. John McCain began. Larry Fitzgerald was seen sitting next to Vice President Joe Biden on the stage. 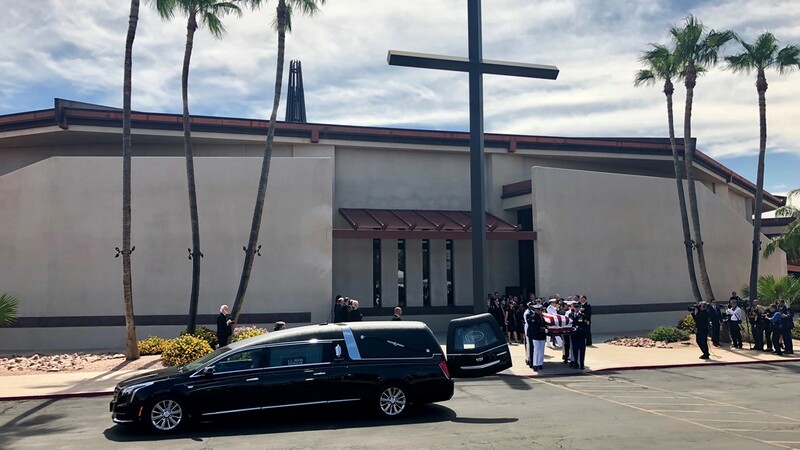 McCain's flag-draped casket was carried inside the North Phoenix Baptist Church. Arizona sports legends Luis Gonzalez and Shane Doan aweree among the pallbearers. 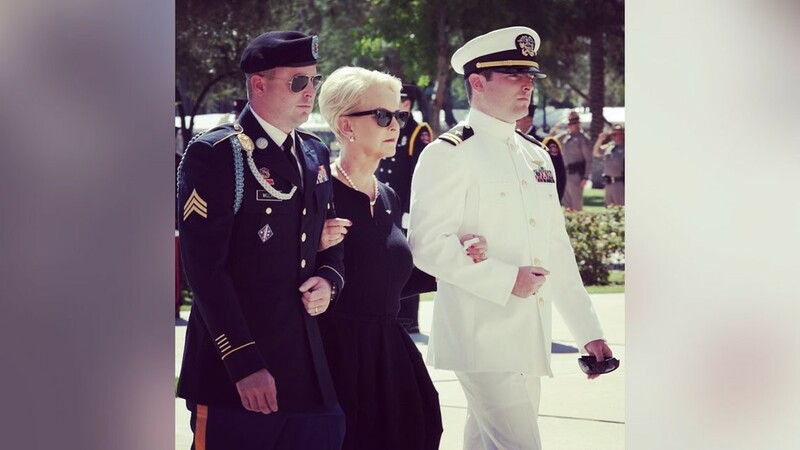 The McCain family followed the casket inside the church. 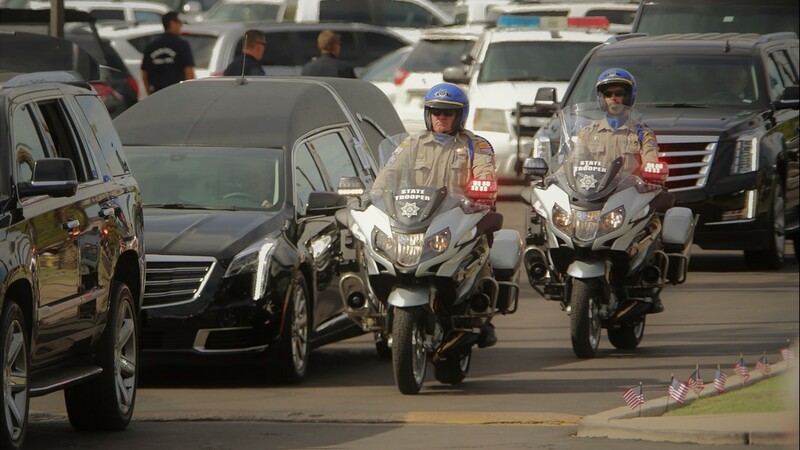 The motorcade arrived at the North Phoenix Baptist Church. Lights inside North Phoenix Baptist Church now dimmed as prelude on piano began. 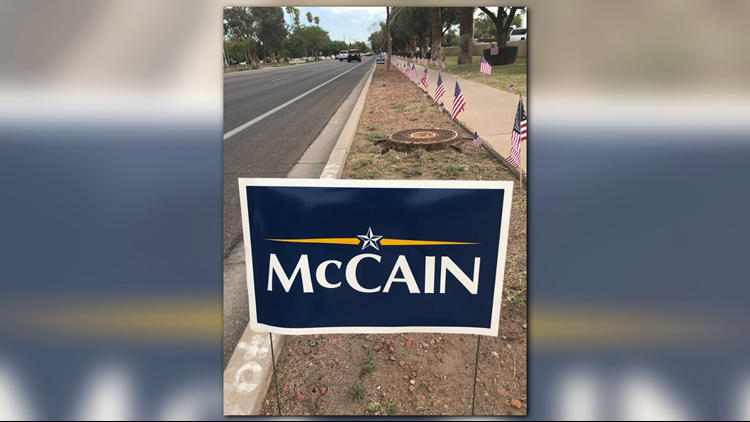 McCain motorcade on Central Avenue came closer to its arrival at the church. More and more people lined the route as McCain's casket moves closer to the service. Ane Kopilas, 81, was born in Croatia. 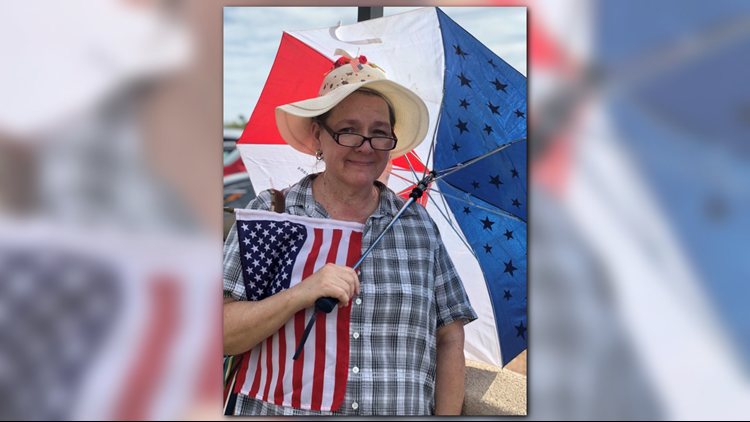 Thursday morning, she sat outside the North Phoenix Baptist Church awaiting the arrival of McCain's procession. 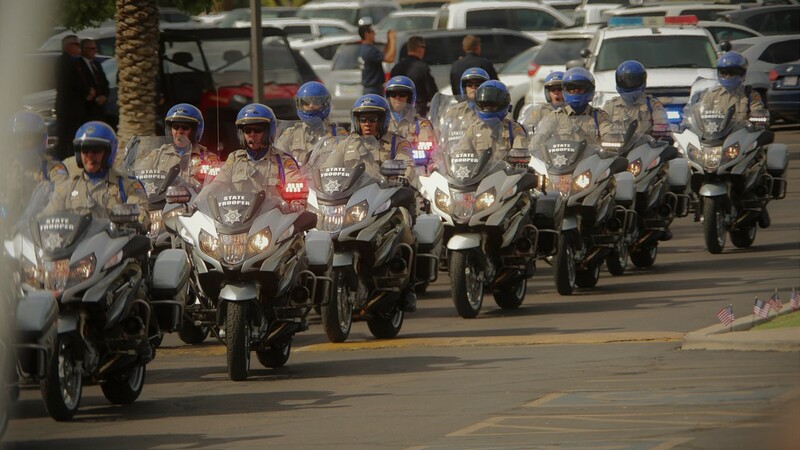 The McCain motorcade exited the I-17 and driving on Camelback Road. In Washington, white flowers sat on a mantel in McCain's Senate office. A small memorial to Sen. McCain was set up earlier this morning outside the Senate Russell Office Building. 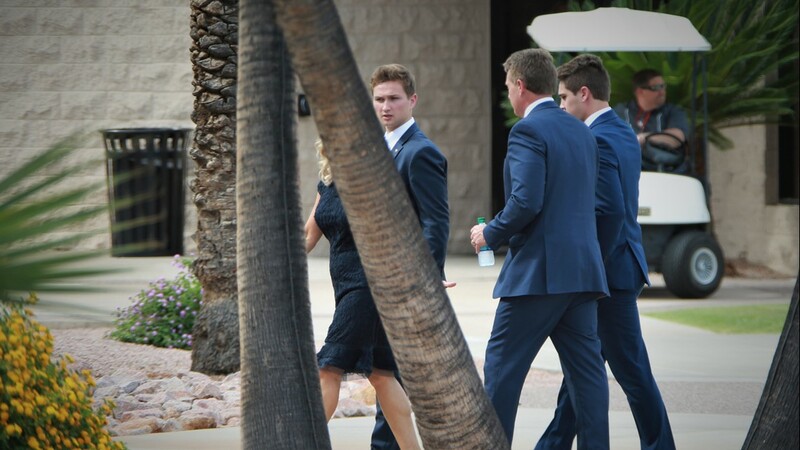 Sen. Jeff Flake and his family arrive at the North Phoenix Baptist Church. Speaking at the church with Team 12's Mark Curtis, Gov. 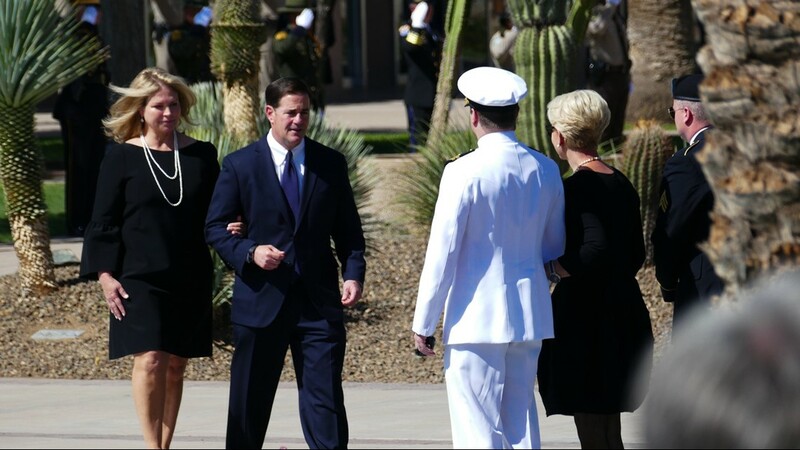 Doug Ducey said McCain "will forever be identified with our state like the Grand Canyon." 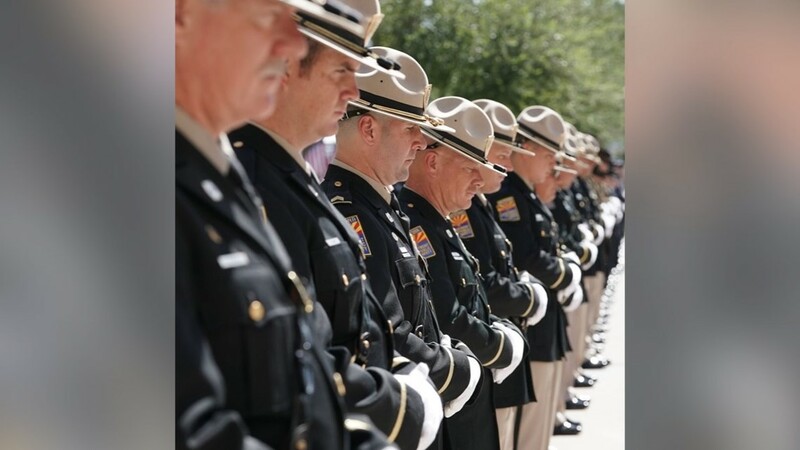 The procession left the Arizona State Capitol on its way to the North Phoenix Baptist Church. 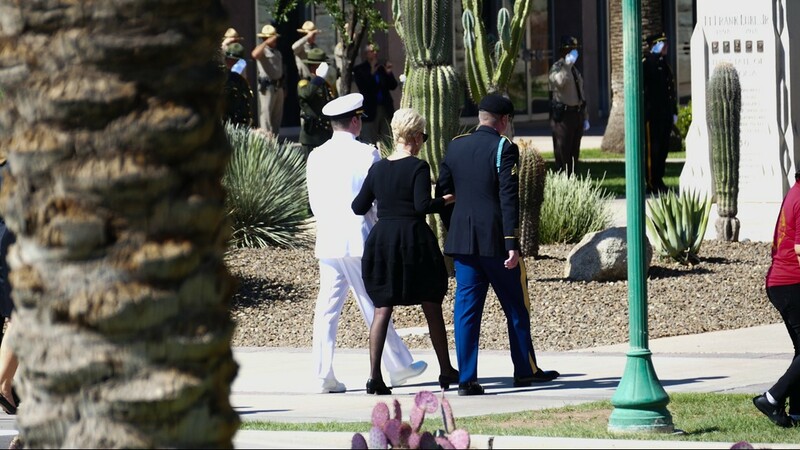 The motorcade and McCain family arrived at the Arizona State Capitol. 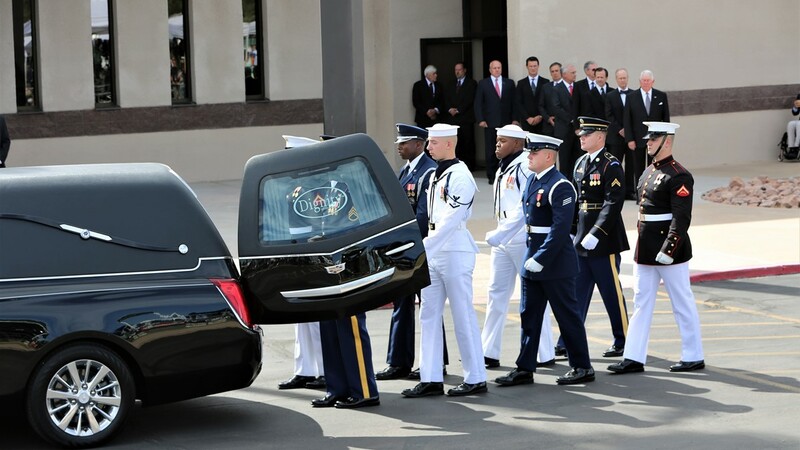 McCain's flag-draped casket was carried out of the Capitol and placed in a hearse. 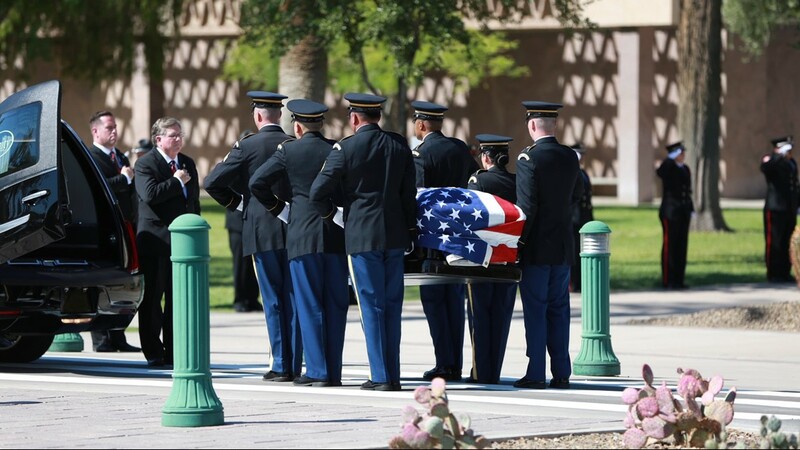 McCain's body was expected to leave the Arizona State Capitol around 9:15 a.m. where he has lain in state overnight. 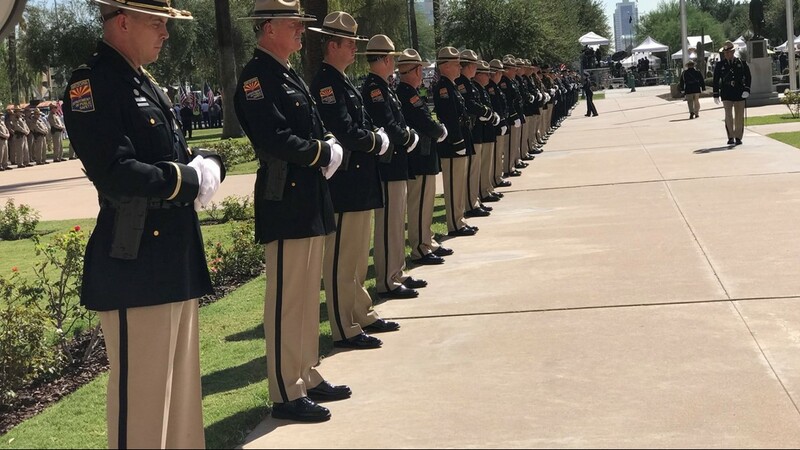 The procession carrying John McCain's body took about 30 minutes from the Capitol to the North Phoenix Baptist Church, according to DPS. 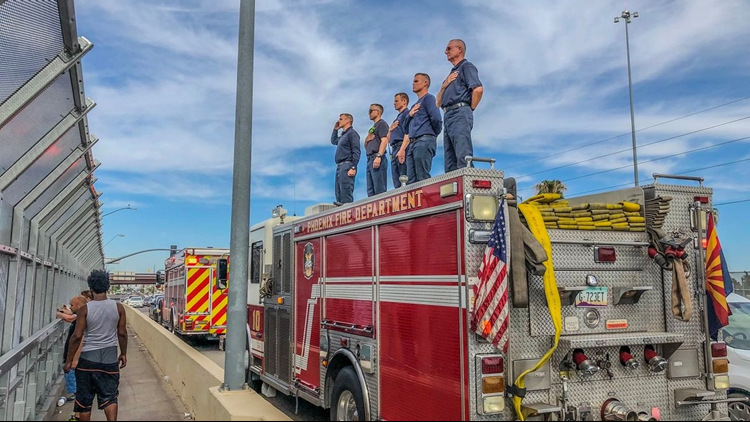 The public was welcome to line up along the route to pay their respects as the motorcade drives along I-17 North, Camelback Road and Central Avenue. About 2,000 flags lined the street leading up to the North Phoenix Baptist Church for today’s service. Honor Guard group gathered around a portrait of McCain at the church. 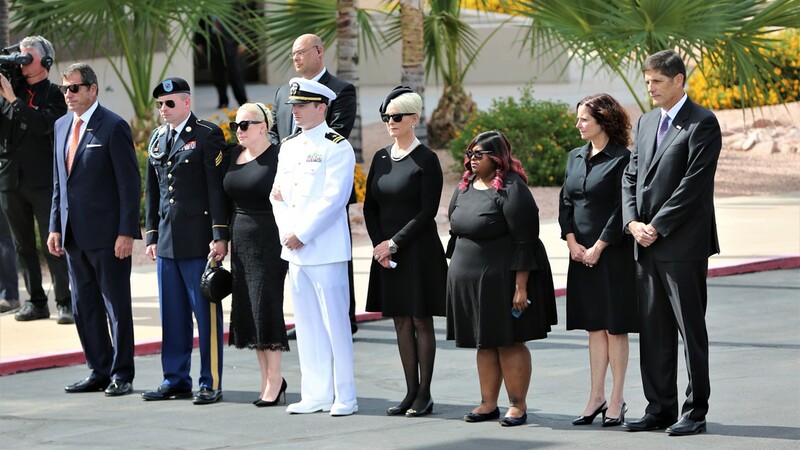 The group said they've been working since Saturday night when McCain's body was brought to Phoenix. Former Arizona Gov. Jan Brewer arrived at the North Phoenix Baptist Church. 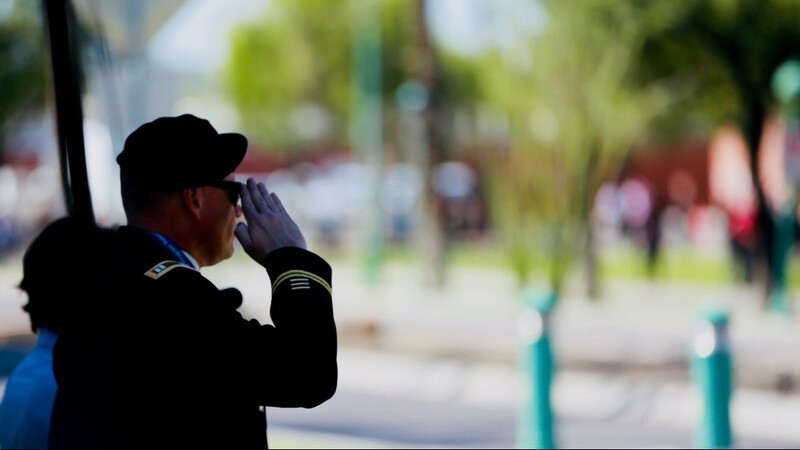 Members of the public who received tickets for McCain’s service as well as plenty of invited guests were seen gathered outside the North Phoenix Baptist Church. 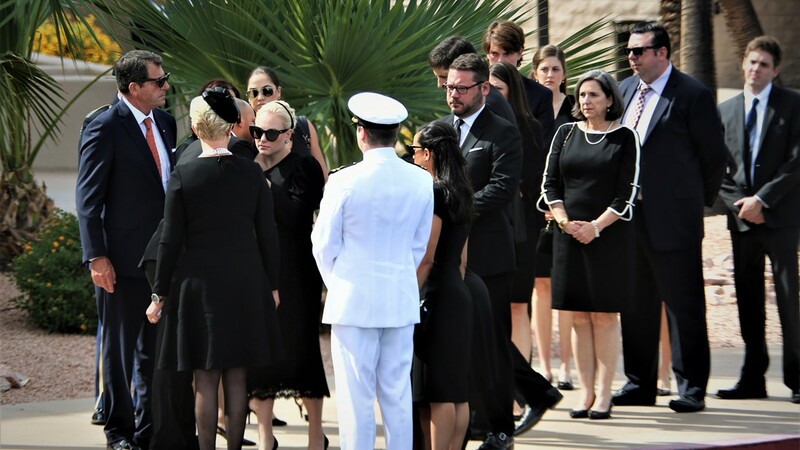 As many as 15,000 people gathered and braved the heat Wednesday at the Arizona State Captiol to pay their respects and say goodbye to the man known as the "Maverick." Mourners were already lined up as a special ceremony took place inside the capitol featuring heartfelt remarks from Gov. Doug Ducey, Sen. Jeff Flake and former Sen. Jon Kyl. Sen. Kyl said "we can be proud he was our senator," while Gov. 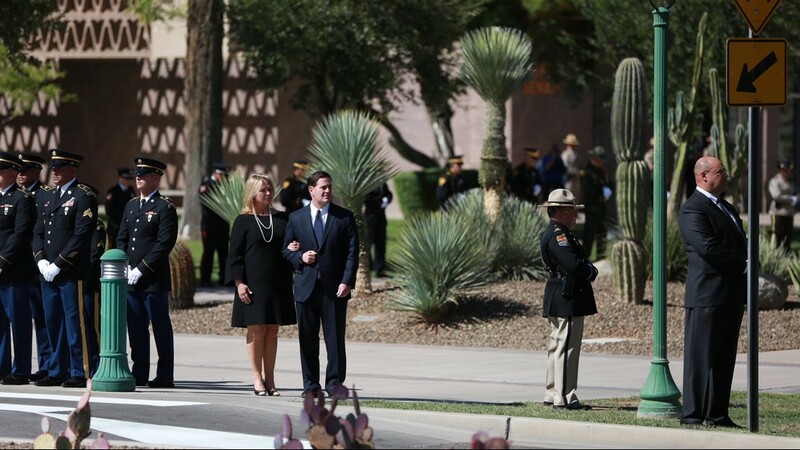 Ducey said "imagining Arizona without John McCain is like picturing Arizona without the Grand Canyon." 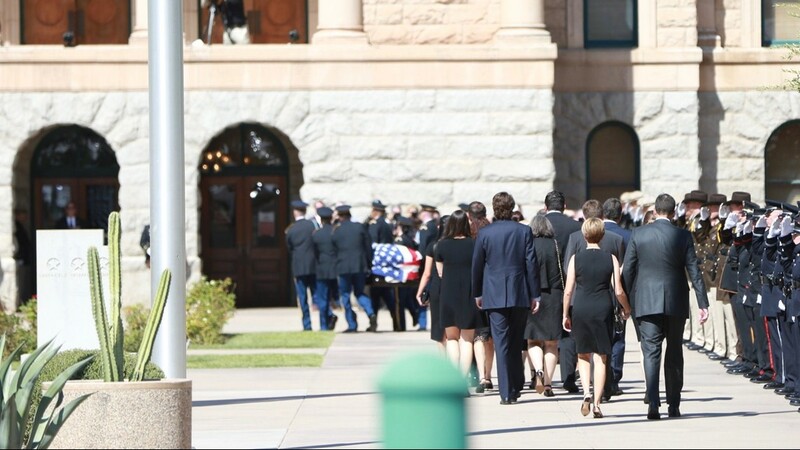 Sen. Flake, with his head bowed in prayer, said "we are especially grateful that John made Arizona his home." 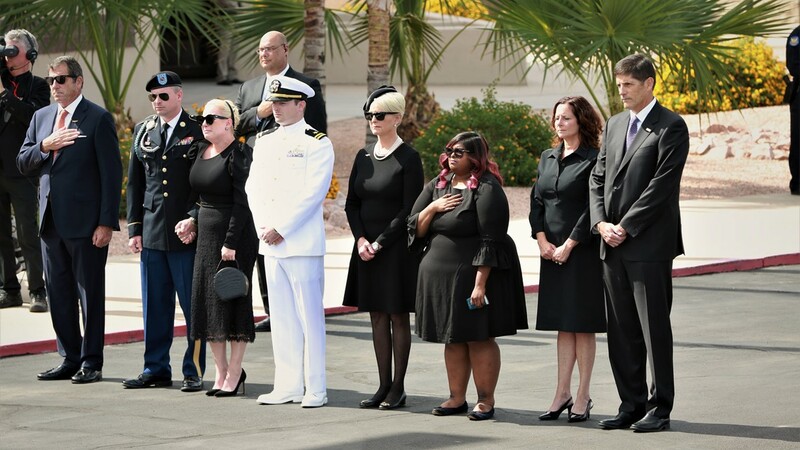 Several of McCain's children greeted those waiting in line to pay their respects late into the night.